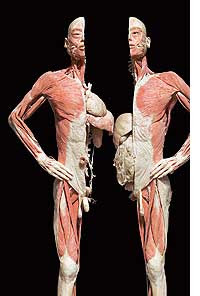 This is a traveling exhibition of bodies. There are several shows traveling around the country at the moment. Many of my coworkers have expressed some doubt about their ability to view this exhibit, given the content. Frankly, I don't think most people would have trouble with it since it's not a gory display. It's presented in a very clean manner and very professionally. That said, I don't have a lot of trouble with blood and guts so I guess I'm not the best person to ask. All of the bodies came from China and were unclaimed at the time of death so they were donated to science. Most of the bodies were male but there were a few women and a large section on fetuses. Some people would probably have difficulty with this part but they warn you ahead of time and you have the option to skip that room. For me, it was the most fascinating part. It sparked a long conversation between Chris and I on what constituted a "person" based on the development of the fetus.